Hey everyone. I know this has nothing to do with Auburn, but it's nice to have a diversion every now and again. My friend Ed Swann, Montgomery tanning magnate, graciously offered me a chance today to drive his wife's 2005 Chrysler Crossfire convertible. To those of you not in Alabama today, it's sunny and 81 degrees -- a perfect day to enjoy this car. The Swanns' sled looks exactly like that. 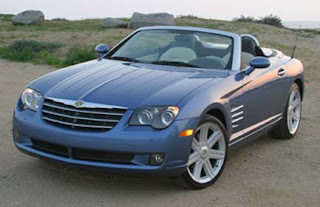 The Crossfire has 19-inch racing tires, a Mercedes V6 engine and the same chassis used on the SLR McLarens. It was a blast. The things that really struck me were the braking (incredibly strong) and how nicely the car grips the road. The engine is pretty loud in a good way. The automatic transmission shifts so smoothly, though it's not one of those mushy SVTs. The engine will pull you as strongly as you choose. Seats were great. Really tight fit for those hard turns. I couldn't justify $42,000 for a two-seat convertible -- I drive a 99 Maxima with widespread paint loss -- but I was quite the happy boy rolling down the road in a Crossfire this afternoon. Auburn fans will love this: The plate reads "Aweburn" and is cradled by a 2004 SEC Champions frame. I'll have to talk with Tuberville to see why Suzanne isn't in something like this. Just kidding, Tommy. I know you're due for $2.3 this season. Isn't life grand? Thanks, Ed!